Introduction – Mamandur and Narasapalaiyam, twin villages, are famous for their four rock-cut cave temples. From the inscriptions, found in these rock-cut shrines, we find that these two villages are under royal patronage of the Pallavas in sixth-seventh century and the Cholas in eleventh century. This suggests that the villages were under continuous royal patronage. One theory is also that the Pallava king Narasimhavarman I Mamalla (CE 630-668) named the village, Narasapalaiyam, after his name. There is an irrigation tank, Chitramegha-tataka, which is assumed to be executed by the Pallava king Mahendravarman I (CE 580-630). One of the cave temples has an inscription of the Pallava king Mahendravarman I, which suggests that probably all the four caves would have been excavated during his reign. This is one of the closest cave temple site from the Pallava capital at Kanchipuram, which also suggests that probably this might be one of the earliest cave temple as well. Pallavas, being ruling over Kanchi, would probably look out for such a nearby rock where they can experiment in rock cut architecture. Mamandur provided such a rock, and what we see, not a single cave temple, but four of them on the same rock. What does it suggest? Was this is workshop ground for them? Let’s see each cave temple in detail and try to find out our answers to these riddles.Monuments – The hill in village Narasapalaiyam runs from south to north and quite huge in its size. 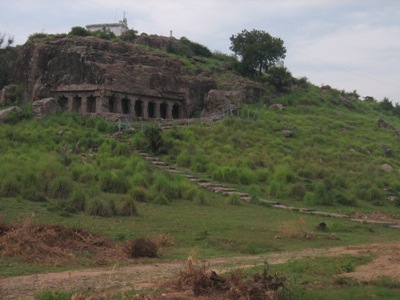 Four cave temples have been executed on this hill, two lies in the revenue village of Mamandur and other two lies in Narasapalaiyam village. There is an irrigation tank, on back side of this hillock, which is described above as well. ASI has numbered these shrines from 1 to 4, while discussing these caves in detail, we will retain the same numbering to avoid any confusion. Cave Temple 1 – This is the north most cave temple among the group of four such temples. This simple rock-cut shrine faces east and its base is about four feet above the ground. There are no steps out of the original rock, hence a separate staircase was constructed. Its façade is supported on two pillars and two pilasters. The pillars are executed in the characteristics Mahendra style while the pilasters are tetragonal all throughout. The pillars have a cubical top and bottom with and intermediate octagonal shaft. The cubical top is small than the lower one in its height, also the bottom cubical part is not a perfect cube as its height is 6 inches more than other sides. This different is easily distinguishable in the first look only. There are lotus medallions on the lower and top cubical faces, except on the hind face. The corbel above the pillars is in curved profile. Behind the front row of the pillars, there is another row of pillars and pilasters. This double bay arrangement creates a ardha-mandapa and a mukha-mandapa , the feature which we see in many other caves of Mahendravarman. On the back wall is constructed a shrine in the center. This shrine is protruding about 1 feet in front from the back wall. The shrine basement has various features of shilpa texts such as jagati, tripatta-kumuda, kantha with two kampa courses. In earlier cave shrine, Kuranganilmuttam, we found the similar elements in the main shrines. There are four pilasters on the entrance of this shrine, two on either side of the entrance and two on boundary. There is ample space, between these pilasters, to carve the dvarpalas, however none was attempted. The cell inside is empty, however there is a platform constructed with a square cavity in it, perhaps to support an a movable image of a deity. Though it is not clear from the inscription to whom this shrine was dedicated, however scholars have assumed that perhaps this was dedicated to Vishnu, as suggested by the inscription. Dvarapalas of the cave – There are no dvarpalas in this shrine. Inscription in the cave – The northern wall of the mukha-mandapa has a Pallava Grantha inscription of Mahendravarman I. Though much of the inscription is damaged, however what is left is very important information. This inscription talks about a composition of Mahendravarman, Mattavilasaprahasan and provides some birudas (titles) of the same king. १५. के कान्ति यथात्र्थेन चन्द्रले [खेब] यागता गात्रन्धः ….. त …… शास्त्रे [षु] [नि] त्याविहितबुध ……. Abstract – There is a reference to the Gandharvasastra. Mattavilasadipadamprahasanottamam in 1.6 is evidently a reference to the composition (by the king). The expression …magavadajjuka… in the same line, is no doubt a reference to the work Bhagavadajjukam (by the same king). Line 12 and 13 seem to suggest that (the king) ‘wanted to achieve what was not achieved before in the realm of music’. Line 18 suggests the form of Vishnu (Megha-syama i.e. colored like the cloud; sahasvadharasampurna i.e., with 1000 torrents) and the term garjita i.e. roaring obviously implies the Narasimha incarnation. The record also mentions the titles Satrumalla, Nityavinita and Satyasandha. Other expressions in the inscription such as Pancalanirmita Valmikivanita, Vatsapahara, Vyasakalpa, Kavinamprakasha, Vrittidabsinacitra and Varnacaturita are interesting. Cave Temple 2 – This cave is located south of the first cave, and faces east. The front façade is supported on two pillars and two pilasters where pillars are in typical Mahendra style and the pilasters are tetragonal from top to bottom. The corbels above the pillars are in curved profile, however the curve is so acute that it looks like angular profile. Though there is enough space left beyond the pilasters, however no attempt was made to carve dvarpalas. One reason for not doing this may be that the inner shrines have their own set of dvarpalas. As seen in other Mahendravarman caves, this cave is also created in two bay scheme, differentiating between ardha-mandapa and mukha-mandapa. For this differentiation, there is another row of two pillars and two pilasters behind the first front row. Above the corbels, on the beam, of the front row, traces of paint is seen which suggests that in those times this cave was painted exquisitely. K R Srinivasan states that the kind and style of painting seems to be similar as seen in Sittanavasal cave. On the back wall of the cave are three shrines, dedicated to Hindu Trinity. As per an inscription of this cave, this cave is referred as Uruttiravalisvaram (Rudravalisvaram), hence the main central shrine should be dedicated to Shiva (Rudra). All the three shrines shares the same platform which is consisted of jagati, tripatta-kumuda, kantha with two kampa courses. All the three has a staircase of two steps in front, the parapet of whose is in form of an elephant’s proboscis. The south-most shrine is perhaps dedicated to Brahma as supported by the appearance of its dvarpalas. Both the dvarpalas are similar in appearance, standing in tribhanga posture, with one hand on their waist and in one hand they are holding lotus flower. They are shown wearing yajnopavita and jata-bhara in form of a bun above the head, as mostly seen with sages of that time. This sagely appearance of the dvarpalas suggests that this shrine should have been dedicated to Brahma. The central shrine also has a pair of dvarpalas. Both of these are similar in their appearance, standing in tribhanga posture, with one hand on their waist and one hand over the heavy club on which support they both stand. The clubs are entwined with serpents. Both wearing huge jata-bhara and yajnopavita and other ornaments like bahu-valaya. Both are carved slightly turned towards the shrine, however they can be termed to be standing in front profile as full face of these is visible. Their appearance suggests that this central shrine is for Shiva, which is strengthen with the presence of a Shiva lingam inside the cell. However this lingam seems to be installed at later time. North-most shrine also has two dvarpala on its entrance. Both are similar in their appearance, standing in tribhanga posture, one hand on their waist and one hand raised in adoration. Wearing a long makuta and yajnopavita, their appearance suggests that this shrine was for Vishnu. The cells of the corners two shrines are empty, but traces of paintings can be seen inside, which suggests that at some time the deities were carved in paint. There are no holes found on the base inside the cells. Dvarapalas of the cave – The three pairs of dvarpalas, one pair for each shrine, have been discussed in detail above. All the three can be termed to be executed in front profile, though two dvarpalas of central shrine are slightly turned towards the shrine. Inscription in the cave – There are two inscriptions in this cave, one is from the Chola king Parantaka I. I am not able to give details on these as the epigraphy book published by ASI is in Tamil only. I will take help from some of my Tamil friends to do the translation. Will update this article accordingly. If you want to help me than please visit this picture and translate this as per your understanding. Cave Temple 3 – This large excavation, largest among the four on this site, is located south of the previous cave. There was a plan to excavate a circumambulatory path around the mandapa however it was left unfinished due to instability of the rock. A similar plan was tried in Pancha Pandava Cave at Mahabalipuram. Many cracks can be seen on the pillars and pilasters, which might be reason that the plan was dropped and the work is left unfinished. This cave faces east and its front façade is supported on five pillars and two pilasters. The pilaster on the southern end can be termed as a full pillar as this is shared with the eastern façade and the southern façade. Some pillars on eastern façade are left unfinished as we do not see differentiation of saduram (cubical top and bottom part) and kattu (intermediate octagonal part), however other pillars are in regular Mahendra style. The corbel above the pillars is in curved profile. The southern façade is with two pillars and two pilasters. Corbels are finished above the pillars, however these are not fully cut in to make the space for circumambulation. The square blocks left inside the wall between these pillars suggests that the work is left unfinished. This cave is differentiated with a ardha-mandapa and a mukha-mandapa with the two bays formed by two rows of pillars and pilasters. There are five shrines on the back wall of this cave. All of these share the same platform, the platform is consisted of upana, jagati, kumuda, kantha with kampa courses. There are staircases in front of all the shrines, consisting of three steps, the lowest one is in form of a semi-circle (chandrasila). The cells are almost cubical and all are empty. No dvarpalas are there, though there is enough space to carve these for the central cell. As the cave was left unfinished so this is quite expected. There are two cells on the side walls of mukha-mandapa which shows that the plan was to have the five celled shrine in middle and a circumambulatory path around this. These cells are not carved fully, however their staircases are carved out which suggests that they were carved to house some deity only. So in total we have seven cells in this shrine, five on back wall and two on side walls. Which all deities were planned to be enshrined in this? In Trichy lower cave, we have seven deities, Shiva and Vishnu in main shrines, Brahma, Ganesha, Subramanya, Surya and Durga in the niches. Was this cave also planned to house these seven deities? May be possible, as the plan of this cave looks similar to the Pancha Pandava Cave at Mahabalipuram which is assigned to Narasimhavarman I Mamalla, also the Trichy lower cave is assigned to the same ruler. By assignments, I do not mean that the assignment were done with conformity but on basis of architectural style and other factors. So if we agree the before two assignments then this cave can also be assigned to Narasimhavarman I and hence these seven cells could be for the same deities as in Trichy lower cave. There are no inscriptions in this cave. As well as no dvarapala inside the cave or on front façade. Cave Temple 4 – This is the south most cave on the hill and smallest as well. This east facing cave is supported on two pillars and two pilasters. The pillars are left unfinished as one pillar shows the differentiation of saduram and kattu while the other one square throughout. The corbel is in curved profile. Inside of the cave is not cut in fully as we see few square boxes left uncut. The front façade was cut pretty deep inside, about 3 feet. The plan was perhaps to excavate a three shrine cave, as seen from the left cubical blocks on back wall. However the work has been stopped in between due to cracks in the rock and load above the roof. How to Reach – Mamandur is located on Kanchipuram-Vandavasi road, and is about 15 km from Kanchipuram. The cave temples are about 2 km inside from the main road, in the village Narasapalaiyam. You need to keep asking the local people to reach the shrines as there are few cross roads inside the village.